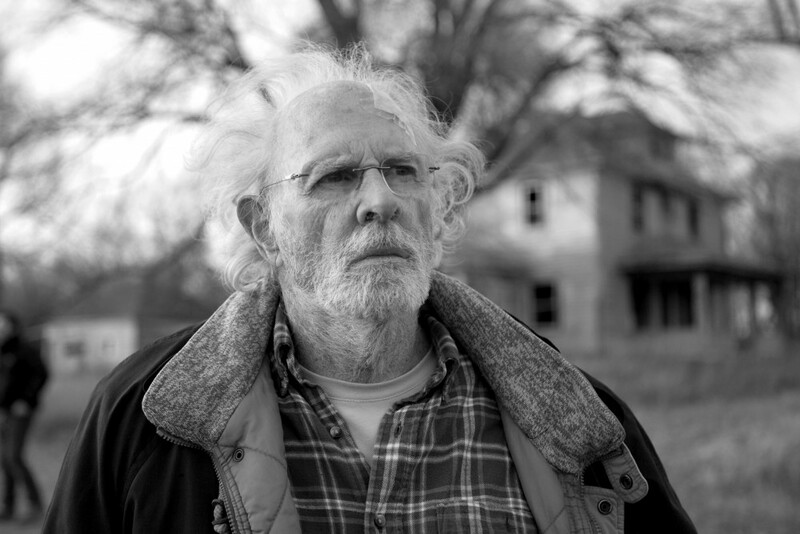 As irascible Woody Grant, Bruce Dern has his eyes on the prize in NEBRASKA. c 2013 Paramount Pictures. All Rights Reserved. If you have aging parents, you’ll probably find yourself in familiar territory in Paramount Vantage’s Nebraska. An Oscar contender for Best Actor (Bruce Dern), Supporting Actress (June Squibb), Director (Alexander Payne), Original Screenplay (Bob Nelson), Cinematography (Phedon Papamichael) and Best Picture, Nebraska is by turns an insightful, tender and painfully humorous look at the walls that separate generations when age takes its toll. Nebraska chronicles the journey of taciturn Woody Grant (Bruce Dern) who’s stubbornly determined to collect a million dollar magazine sweepstakes prize. The contest is an obvious sham but not to Woody who, barred from using his driver’s license, decides to walk, or as Dern brilliantly plays him, shuffle his way to Lincoln, Nebraska, from his home in Montana to cash in his “prize-winning” letter. His son David (“Saturday Night Live” alum Will Forte in a wonderfully nuanced, Oscar-worthy performance) finally agrees to drive his pig-headed dad to Nebraska. Mom Kate (June Squibb) finally takes the wheel in NEBRASKA. c 2013 Paramount Pictures. The men make a pit stop in Woody’s dreary hometown farming community, where they reconnect with Woody’s former pals, his numerous lifeless brothers and their slacker sons, most of whom are looking for payback. When David’s mom, Kate (June Squibb), and brother Ross (Bob Odenkirk) join the impromptu Grant family reunion, it becomes apparent they all have more than a few fences to mend. While this may sound like a conventional male bonding road picture, with a bucket list tied to one end, it is far from it. Director and native Nebraskan Alexander Payne (About Schmidt, Sideways, The Descendants) and screenwriter Bob Nelson (a native of South Dakota) have an obvious affinity for the minutiae of family dynamics and dysfunction in the hinterlands. They are especially adept at examining the male psyche (as fathers, sons, lovers and friends) without resorting to cheap melodrama and excessive raunchy language. The women, although peripheral to the action, are clearly the gatekeepers. There’s sharp-tongued mom Kate (June Squibb) who hilariously tells it like it is; David’s fed-up girlfriend whose departure triggers David’s self exploration; and Woody’s unexpected first love, who wistfully recalls her beau in a softer light. David is the lynchpin here. His love for his dad is evident during the often comical banter they share over a bottle of beer and during emergency side trips to the E.R. and contretemps with his dad’s old cronies. Whether he’s tracking down the whereabouts of his ale-addled dad’s false teeth, hovering over his cranky dad in the hospital, or offering a sane voice and steadying hand during visits to his dad’s old haunts, David finally gets his chance to close the gap and forgive the father he’s been dodging for his entire adult life. For both men, this “prize” is well worth the journey. This entry was posted in Film and tagged Academy Award Nominee, Aging, Alexander Payne, Bob Nelson, Bruce Dern, Family Relationships, Fathers and Sons, June Squibb, Men's Studies, Nebraska, Phedon Papamichael, Will Forte. Bookmark the permalink. The Red Sox overcame the curse of trading Babe Ruth by winning the World Series. And after his performance in Nebraska, Bruce Dern may overcome the curse of shooting John Wayne by winning an Oscar. I agree that Will Forte is especially strong in this film. I also really liked Bob Odenkirk as David’s brother, though his role is smaller. Woody’s nephews were not credible to me; they were too exaggerated. Also found it somewhat unbelievable that so many people seemed to actually believed that Woody was in fact a millionaire. That aside, it’s a very good film. Nice to see Bruce Dern getting some recognition after such a long career. I didn’t have a problem with Woody’s nephews; in fact, I felt they added some comic relief. Since his old cronies and family in his hometown apparently hadn’t seen Woody for years, they had no reason not to believe in Woody’s pending good fortune, until, that is, they found out how he supposedly “won” the sweepstakes. The tide turned as soon as they found out. Yes, the nephews did add comic relief; I just didn’t find them to be believable characters in that context. I come from that world, though small-town Iowa rather than Nebraska, and the details of Woody’s home town definitely rang true. Nice review Judith. It’s the exact type of sweet, small and rather subdued flick you’d expect to see from Payne, except not as brilliant. Just a bit more raw though. Thanks for the review, Judy. We’re going to try to see it this weekend.